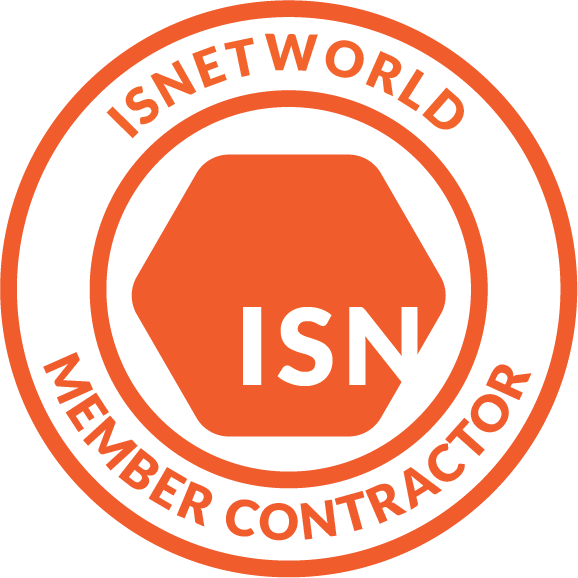 This page provides answers to typical questions specifiers have, regarding ESD epoxy floor coating systems. Is there a difference between static dissipative and static conductive flooring? What is Anti Static flooring and Conductive flooring? The words antistatic and conductive are general terms for ESD flooring. However, Antistatic or Conductive do not designate an electrical resistance range. Antistatic and conductive properties are part of an ESD control program, which includes electrical resistance to ground, as well as tribocharge performance. Does relative RH affect the performance of an ESD floor? When the RH (relative humidity) is low, static charges buildup faster Static charge capacity also increases on surfaces when the air is dry. This can be a problem for antistatic flooring such as carpet and vinyl. 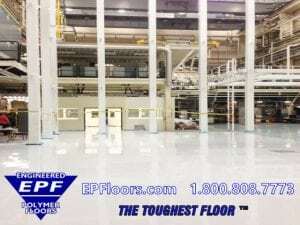 In comparison , resistance to ground does not vary with humidity for EPF’s epoxy ESD floor system. How long will the conductive properties last? Conductive properties may not last for the life of the product. Check with the vendor. Many vinyl products require regular application of an antistatic wax, in order to maintain acceptable electrical properties. ESD carpets also require periodic applications of a topical antistatic treatment. In contrast, EPF electrostatic flooring maintains conductive properties for the life of the product, even as it wears. No maintenance is required to maintain it’s electrical properties. The conductive properties are “built into” the floor due to graphite micro particles. How are ESD epoxy floor coatings made conductive? ESD floor coating manufacturers utilize different methods for making the coatings conductive. The newest technology, and most reliable, is the inclusion of carbon and graphite particulate. Older technologies, such as fiber technology, or a combination of these two, are less reliable. Can your new floor be installed over an existing floor? This usually requires an analysis of site conditions, including detailed photos and/or site inspection. Generally speaking, a new epoxy or polyurethane ESD floor coating system can be installed over an old esd floor coating, as long as the old floor coating(s) is well adhered. For existing vinyl floors, it must be structurally intact, and bond testing must be performed, with further analysis required. Do I need to worry about moisture protection w/ ESD floor systems? Moisture emission through concrete slabs can cause problems with all types of seamless and vinyl flooring. Most manufacturers recommend that levels do not exceed 3 pounds of moisture (per 1000 square feet per 24 hour period). This may cause serious problems, such as delamination, blisters/bubbling, cracking, and staining. High moisture can also lead to the development of bacteria and molds, which, in addition to causing foul odors, contribute to sick building syndrome. Testing the concrete floor for water vapor emissions is easy, low cost, and can prevent headaches and expense in the future. Read more about concrete moisture facts. Can bare concrete be utilized as an anti static floor? Unsealed, bare concrete floors contain varying levels of moisture. The concrete will exhibit antistatic tendencies, depending on the concrete relative humidity level. The higher the moisture content, the higher the conductivity. Due to variable moisture levels, concrete has very unpredictable conductivity. Concrete floors cannot be ESD control flooring due to unpredictable electrical resistance. The electrical conductivity will change due to varying environmental and soil conditions. This prevents certification as an ESD floor. Additionally, unsealed concrete is hard to clean, and can release cement dust into the air. Can a conductive floor become a “live wire”? The short answer is yes. 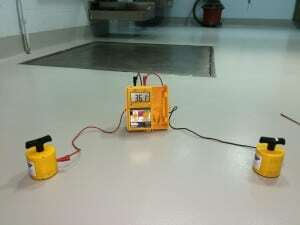 However, as long as the ESD control flooring has a resistance to ground > 25,000 ohms the floor can be used in manufacturing and industrial applications. Industry standards set the 25,000 ohm number as the safe lower parameter for resistance, in case an outlet or other 115 volt source is “shorted” to the floor.